3BA '', which is incorrect. It should have been `` 3BA ''. This entry last updated 25 Februrary 2002. This entry updated before 7 March 2001. (for example, XIV , CIX , DVL ). (for example, XIV , CIX , DXL ). Note that, since the empty product is 1, it follows that . If is a negative integer ( ) then . The generalization of the factorial is the function (see page 494). positive definiteness: for all , in , and if and only if . This entry last updated 5 October 2001. Single quadratic factor: When and are both real, if after multiplying the equation by a root of is substituted for , then the values of and can be inferred from this single complex equation by equating real and imaginary parts. Similarly for Repeated quadratic factors. In other words, the number of equations needed is half the number stated. Section 2.3.1, Values, page 87, presently has ``There are 32 Carmichael numbers less than one million'' which is incorrect, it should have been ``There are 32 Carmichael numbers less than one million''. Only if is square and non-singular, will be unique and . Otherwise, there will exist infinitely many matrices that will satisfy the defining relation. There is a unique pseudoinverse satisfying the conditions in (2.5.26). If, and only if, is square and non-singular, then . There are also several other small errors in sections 3.2.8 and 3.2.9. The sequence marked with a ``7 S'' in the first column should be marked by a ``7''. The third sequence marked by a ``7'' in the first column should be marked by a ``7 S''. A curve parameterized by arclength and such that the curvature is proportional to the parameter at each point is a Bernoulli spiral. A curve parameterized by arclength and such that the radius of curvature is proportional to the parameter at each point is a Bernoulli spiral. A curve parameterized by arclength and such that the curvature is inversely proportional to the parameter at each point is a Cornu spiral (compare the Bernoulli spiral). A curve parameterized by arclength and such that the radius of curvature is inversely proportional to the parameter at each point is a Cornu spiral (compare the Bernoulli spiral). Line 5 now has ``in a line '', which is incorrect. It should have been ``in a plane ''. Line 6 now has ``in a line '', which is incorrect. It should have been ``in a plane ''. A rotation-reflection (rotation through an angle around a line composed with reflection in a plane perpendicular to ). This entry last updated 20 September 2001. The solutions are: (furthest), and (closest). If , then and other formulae should be used. , , is an odd integer. FOOTNOTE: An alert reader will wonder how these errors could have occurred, since the integrals in the 30th edition of this book have been electronically verified. The error occurred in the typesetting of the integrals--not in the electronic verification of the integrals. 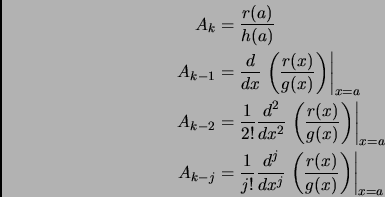 In this section on definite integrals, there are 11 integrals in which there were two integrals on the same line; in all cases the limits on the first integral were (sometimes incorrectly) printed as the limits on the second integral. This resulted in the errors listed above. Section 5.5, TABLE OF DEFINITE INTEGRALS, page 400, integral number 646 presently has `` ''. This statement is not needed since does not appear in the integral. Section 5.5, TABLE OF DEFINITE INTEGRALS, page 400, integral number 648 presently has `` ''. This is incorrect, it should have been `` and even''. Section 5.11.1, LIST OF ORTHGONAL COORDINATE SYSTEMS, pages 442-445, each formula of the form `` '' should have instead been `` ''. then, taking Laplace transforms, where is the transfer function given by . A system is said to be controllable if and only if for any times and any states there exists a control such that and . The system is controllable if and only if rank . If, given and on some interval , the value of can be deduced on that interval, then the system is said to be observable. Observability is equivalent to the condition rank . Section 6.4, SPHERICAL SPHERICAL TRIANGLES page 468. Figure 6.4.3 and the first line of ``Napier's rules of cicrular parts'' both presently have ``co- ''. This is incorrect,it should have been ``co- ''. is the probability that a Markov chain in state at time will be in state at time . Section 7.13.3, MATCHED FILTERING (WEINER FILTER), page 660, the name ``Weiner'' is incorrect; it should have been ``Wiener''. Section 8.3.1, NUMERICAL INTEGRATION, page 693, Closed Newton-Cotes formulae, number 3, a closing square bracket is missing. That is, `` '' should have been `` ''. Section 8.3.1, NUMERICAL INTEGRATION, page 695, the title Method H.2.1.2 Romberg Integration should have been Romberg Integration. Question number 5, answer. The computation as stated is correct, but the numerical evaluation was performed incorrectly. The monthly payment is not $755.63, it should be $804.62. Question number 6. The statement ``spending $600 per month'' should be changed to ``spending $800 per month''. Question number 6, analysis. The statement `` '' should be changed to `` ''.